Urea, Calcium Silicate (Anticaking Agent), May Contain:, Mica, Iron Oxides. broke me out within a week of wearing it. looked good on skin though. 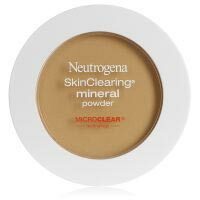 Neutrogena has always been great for my skin and this powder is no exception! It provides normal coverage, but over time, it really does help clear up your skin.